I love your little friends, they are so cute!! And thank you for your little give away my kids are so excited for the chance for them to come and visit our house. I love them.... My favorite blog is whip-up blog , so many ideas of all sorts. Wow - these are so cute, my little girl would love them. Judith makes some wonderful bags, and she has given me some great advice since I started blogging. It's a great quick way to start the day with a good laugh! I like a lot of blogs. But I really like sewmamasew.com and a diary of a quilter blog. 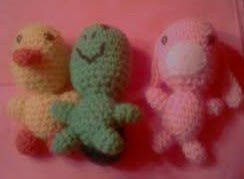 Cute - i would love to learn how to crochet! Love how cute these are! One of my favorite blogs is www.rufflesandstuff.com/ Disney has such cute stuff! Adorable! I enjoy Loved Stitched. Great blog! those are so adorable! My favorite craft blog is http://modabakeshop.com I get great ideas for quilts there all made easier by using precuts. They are so cute! I have a new little nephew that I would love to give them to! A favorite blog of mine is http://tollipop.typepad.com. Why so few comments? Silly people. (One point - it may just be my browser, but the pink text on the brown background is very hard to read.) (Then again, I changed my blogger theme and changed nothing else, so mine's nasty, so who am I to criticize?) But these are adorable. My favorite is marmeecraft.blogspot.com - My Cozy Little Whimsy Nook - because I love the imaginary world she creates for herself.